The first and last shots of world war 1 were fired in Africa, not Europe. How come? And why do modern Great War ceremonies and films give the impression that only Americans and Europeans died for “freedom”? Africans contributed money, skill (in producing goods to aid the war effort) and the human sacrifices needed to call it a world war. The era of German colonialism that lasted till 1918 had left Africans who fought for Germany either dead, injured for life, without ex-service pensions and with financial losses. These Colonial institutions contributed to poverty, a culture of abusive police and abusive armed forces, African independence movements as Africans fought for Europeans but lacked democratic representation at home, and contributed to a feeling of entitlement of Africans to settle in Europe after the war. We will never know how many African soldiers on the German side died during World War 1 because no country remembers them. And who can speak of their descendants? After the Scramble for Africa, German created a series of units that provided the manpower to implement the German colonial will in its conquered territories. It created Colonial Police Forces (Polizeitruppe and Landespolizei), Imperial Navy overseas (including the Marine Infantry) and the Schutztruppe – troops of the colonial African soldiers led by volunteer German commissioned officers and non-commissioned officers. These armies also positioned Germans for other posts such as medical and veterinary officers. But the low ranked jobs like of gatekeepers and much more were awarded to the local people. These colonial forces existed from 1891 until the defeat of Germany in 1918. Africans were recruited in the German colonies of Africa (in East Africa, Cameroon and South-west Africa) and had a major task to conquer other non-occupied territories by force. Military units were formed in German East Africa, where they became famous as Askari, in the Kamerun colony of German West Africa, and in German South-West Africa. Control of the German colonies of New Guinea, in Samoa, and in Togoland was accomplished by small local police detachments. As part of the East Asian Station, the navy was put on duty at Tsingtao, China, including the marines of 3rd Sea Battalion, the only all-German unit with permanent status in an overseas protectorate. When the German Reich, became a colonial power in 1884/85, no allocation was made for the creation of national military formations in the German colonies. Chancellor Otto von Bismarck (1815-1898) provided an idea to have all instruments of power established and financed merely by the trading companies active in these territories. But the companies either rejected to do so, as in Togo and Cameroon or spent so little in their troops that these provided no serious numbers. In 1889, native opposition in East and Southwest Africa forced Bismarck to finally accept a need to create colonial corps manned by Africans. Though financed by the state, these troops were organized under private law, since the administration of both colonies remained the responsibility of trading companies. All German members of the armed forces had to quit, then re-sign contracts of employment with the commanders Hermann Wissmann (1853-1905) and Curt von François (1852-1931). After the so-called “Araber-Aufstand” (Abushiri Revolt) had been squashed, and the German Reich had subsequently taken over the administration of East Africa, the “Wissmann-Truppe” was the first formed, later to be transformed into a “Kaiserliche Schutztruppe” (Imperial Protection Force) on 22 March 1891. The original agenda did not include any alteration of the police forces in Togo, started in 1885, or those in Southwest Africa and Cameroon, started in 1891. Increasingly frequent aggressive conflicts with native tribes, however, exposed the imperfections of the existing instruments of power. [i] Therefore on 3/4 May 1894, the Chancellor gave orders to transform all police forces in Southwest Africa and Cameroon after the structure of the German East African Schutztruppe. The change of identity was officially declared by Wilhelm II, German Emperor (1859-1941) on 9 June 1895. In 1894 the police force in Togo was also reformed with the intention of transforming them into a Schutztruppe at a later date. But the programme of changes was hampered again and again until finally abandoned in 1900. The word Askari simply means “soldier” or “police” in a number of languages, including Arabic, Turkish and Swahili. Colonial armies operating in eastern, central and southern Africa applied the name to their rank-and-file African soldiers, regardless of the soldiers’ particular regional, linguistic or ethnic origins. 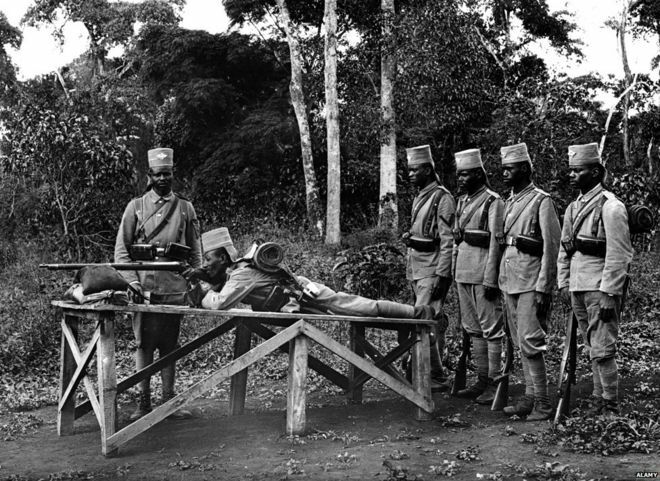 The Askari of the German colonial army (Kaiserliche Schutztruppe für Deutsch-Ostafrika, or Schutztruppe) became widely known owing to their role in the East African campaign of World War I. East African recruits included Swahili, Nyamwezi and Manyema men drawn from in and around German East Africa, and included former retainers of the Deutsch-Ostafrikanische Gesellschaft (German East Africa Company). The Germans paid their recruits very well, exceeding two times the pay of British askari, and also elevated them to relative positions of privilege compared to non-military Africans in German territories. For these reasons, Schutztruppe Askari had few incentives to look elsewhere for employment until the demise of Germany during World War I. In regard to pay, they likely fared better than their British, Belgian and Portuguese counterparts in the surrounding colonies. Between 1890 and 1914, the Askari of the German colonial army was primarily responsible for the territorial conquest of German East Africa, as well as for the day-to-day policing and administration of the colony. Their roles in the suppression of anti-colonial resistance, particularly during the Maji Maji War of 1905-1908, established their reputation as ruthless agents of colonial violence, whose scorched earth methods spelled disaster for many East African communities. Their officers trained them to operate in small formations with little oversight and to manoeuvre with great speed and independence. [iii] They were also organized into eighteen field companies of 150-200 Askari apiece, and each company had its own porter contingent and medical doctors. By contrast, in 1914 the British King’s African Rifles (KAR) was organized into three battalions, which used a cumbersome and comparatively weak eight-company format that was more suited to confronting a European enemy than the Schutztruppe. 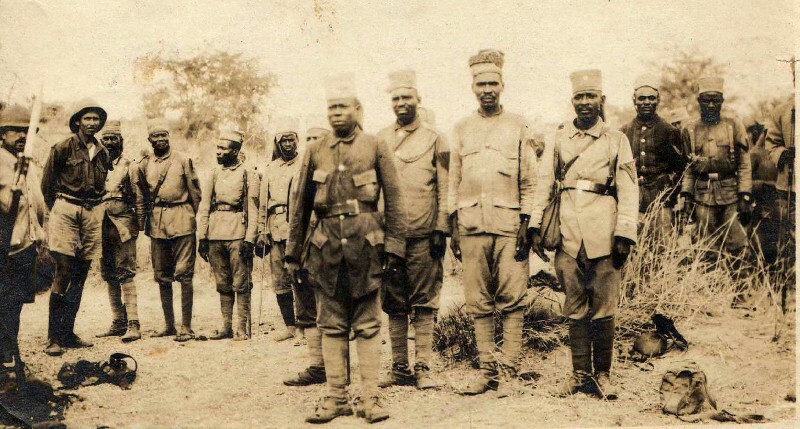 A fourth battalion, the 2 KAR based in Nyasaland, was disbanded in 1911, with many of its soldiers then crossing into German East Africa to join the Schutztruppe. This meant, in effect, that race played a defining role in the military hierarchy as well. Senior Askari took on day-to-day leadership roles in small unit combat operations and conducted training for the rank-and-file. Using the privilege they gained through their positions in the colonial administration, and the resources they gathered through plunder and wages, many of them built lives as local big men, assembling large households around them, and often acquiring pieces of land and herds of livestock that displayed their privilege and authority to those around them living under colonial rule. In the first half of the war, most Askari were longer-term members of the Schutztruppe or volunteers. The Germans scored some successes in the battle against their Allied opponents, most notably at Longido and Tanga in November 1914. But in the second half of the war, as wartime conditions in German East Africa worsened, the Schutztruppe increasingly failed to attract new recruits and began resorting to forced conscription of able-bodied men on a larger scale. As the Schutztruppe’s situation deteriorated, the army became confined to the southern half of the colony, with the Allies dominating the northern half. Following the Battle of Mahiwa in October 1917, where both sides suffered massive casualties, Lettow-Vorbeck led his column across the border into Portuguese East Africa. There, the Askari and other column members lived off the land, seizing what they could from captured Portuguese forts along the way. Women, children and forcibly conscripted porters also accompanied the column as it marched through Portuguese East Africa, evading Allied capture for the rest of the war. In September 1918, his column re-entered German East Africa, and then crossed into Northern Rhodesia. [vi] Finally, after receiving news of the armistice in Europe, the Schutztruppe surrendered at Abercorn, Northern Rhodesia, on 25 November 1918. Some 1,100 Askari were present at the formal surrender. During and after World War I, the Askari of the Schutztruppe gained widespread notoriety for their fighting skills, as well as for their supposed dedication and loyalty to Lettow-Vorbeck, and by extension, to the German Empire. The truth was more complicated. Most Askari who remained to the end of the campaign were men who had been members of the Schutztruppe when the war began and thus viewed it as the protector of their long-term interests. Thousands of others died in the war, became captives or deserted the army, often ending up in the ranks of the British colonial army in East Africa the KAR. In particular, in April 1917 the British created the two battalions of the 6 KAR in order to make use of captured ex-German Askari. In an interesting twist, these Askari may have included men who had joined the Schutztruppe following the disbanding of the 2 KAR in Nyasaland in 1911. They had come full circle. The era of German colonialism that lasted till 1918 had left enlisted Africans who fought for Germany either dead, injured for life, without ex-service pensions, forcibly conscripted in the Allied forces as captives, with financial losses and forgotten by “public memory”. We will never know how many African soldiers on the German side died during World War 1 because no country remembers them. (vii) UNESCO. Africa and the Second World War, Report and papers of the symposium organised by UNESCO at Benghazi, Libyan Arab Jamahiriya 1980.